Complies with all Federal Highway Administration (FHWA) and National Cooperative Highway Research Program 350 (NCHRP 350) regulations. Bracket is made of 14 gauge, A36 steel with a black powder coating. Flanges come pre-drilled with holes to facilitate easy installation and compatibility with various types of mailboxes. Keep your mailbox sturdy AND safe for passing motorists with mailbox brackets by SHUR-TITE! 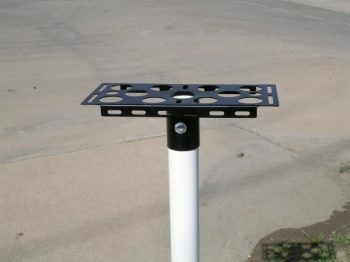 These brackets are the only ones on the market specifically designed for mailbox posts with a 2 ⅜″ outside diameter. The bottom cylindrical sleeve (made of 16 gauge, 1020 steel) is welded to the bracket, making for easy installation and a durable final product. SHUR-TITE single brackets work by way of a pair of downwardly extending flanges formed on the long edges of each plate. To install, simply use the included hardware to attach any standard-sized metal mailbox to the bracket. Please note that brackets and support poles are sold separately.